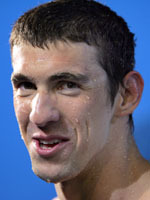 Michael Phelps will again race for eight gold medals to try and outdo tMark Spitz's Games record of seven titles. The American champion won seven golds in eight events and set five world records at the 2007 World Championships inAustralia, and said that he was gunning for the same eight races in Beijing. "In all honesty, I really would love to have the opportunity to try that same program again next year," said Phelps of his Olympic preparation. Phelps became a worldwide household name by winning six gold medals during a spectacular display at the Athens Olympics. Spitz's seven gold-medal standard has stood since the 1972 Munich Olympics, though Phelps is now challenging his mantle as the greatest swimmer of all time. He now has 11 world titles and 25 world records to his name and the "Baltimore Kid" is a long way from being finished. As Spitz had done before him, Phelps did claim four individual Olympic titles; the 100 and 200 butterfly and the 200 and 400 individual medley. Another unforgettable experience for Phelps at the 2004 Games was his co-star role in the so-called "race of the century" when he pushed Ian Thorpe and Pieter van den Hoogenband all the way to claim a bronze medal in the thrilling 200 freestyle. The graceful youngster was delighted with his bit part in that race, perhaps knowing that despite his already brilliant showing, his finest hours were still ahead of him. Sure enough, at the 2005 worlds, it was Phelps who took the 200 freestyle gold, albeit in the absence of Van den Hoogenband and Thorpe. And by the time Melbourne 2007 came around Phelps, 21 and at the top of his art, won the 100 and 200 butterfly, 200 freestyle, 200 and 400 medleys and the 4x100 and 4x200 freestyle relays. He would have won an unprecedented eight golds, but his teammates botched a changeover in the medley relay heats and were disqualified while he was being rested from the anticipated final. Since breaking onto the scene Phelps has grown up in the public eye with some typical teenage troubles such as being pulled over while driving under the influence of alcohol. He first took to the pool at the age of 7 and was undoubtedly influenced by his two elder sisters, including Whitney, who competed at the U.S. Olympic trials in 1996. At 15 he was the youngest male American since 1932 to take part in the Olympics, where he finished a very respectable fifth in the 200 butterfly. Just a year later he bagged his first world championship gold in the 200 butterfly, adding another three golds in the 200 and 400 medley and the 4x100 medley. The 6-foot-4 Baltimore native won three gold and two silver medals breaking five world records in the process. Phelps will be just 23 when Beijing takes place and he may well go on to become the most successful Olympian of all time. After all, he "only" needs to win another 10 medals to emulate Russian gymnast Larissa Latynina.